One Day in Rome - Make the Most of it! Even if you only have one day in Rome, you would be surprised at how much you can get out of this day! Visiting the colosseum in Rome - you can do this, and more, in one day! For years, running our boutique hotel in Rome, I've helped thousands of Rome visitors get the most out of their stay, even if it's just one day long. And there is no one solution for everyone. So on this page, I've outlined some options for one-day-in Rome itineraries for the unique traveller in you. You just want to see the highlights, but as many as possible. You really want to see the Vatican Museums and inside the Coliseum. You think one day in Rome is too short to try to see everything, so just want to leisurely enjoy walking around the center. You are here to shop! You really don't want to sight-see, but rather just soak up some Roman atmosphere. You have been to Rome before, and you want to see something new. You are here with young children and want them to have fun without exhausting them. With the City Sightseeing open bus tour in Rome, you can get a great overview of the city, from the comfort of an open-air bus - complete with roof in case of rain! A full loop without getting off takes about 1.5-2 hours. Or, you can hop on or hop off the bus throughout the day (most offer 24-hour passes and 48-hour passes.) They all include the main sights such as the Coliseum, Trevi Fountain and the Vatican. You can board these buses at any point along their route, so you can start closest to wherever you are staying. You can pay when you board, or book in advance. Many of the sights in the historic center are not visible from the bus (and the bus cannot get into where these sights are), so you will have to get off the bus and walk in to actually visit some of the sights. Do you want to see the Vatican, Sistine Chapel and the Coliseum all in one day in Rome? It can be done! Of course I'd recommend more time in Rome but I realise sometimes people only have one day. 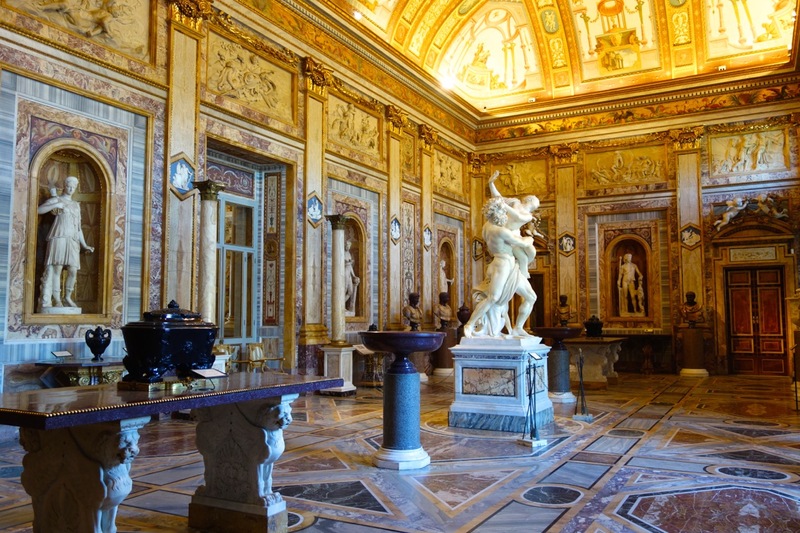 To fit this into a one-day in Rome visit, just know that a visit to the Vatican Museums and Saint Peter's Basilica takes about 3 hours. A visit to the Coliseum and the Roman Forum also takes about 3 hours. If you are doing this on your own, I'd recommend going straight to the Vatican and visiting the Vatican Museums and then the Basilica. Then, make your way either on foot or by bus to the Forum, visiting that first, then the Coliseum last. To get to the Vatican take the Metro red line A to the Ottaviano stop. When you come out of the stop, you can see the crowds moving towards Vatican Square, which is about a 5-minute walk from this stop. If you walk from the Vatican to the Coliseum, you can go through the center, passing Piazza Navona and the Pantheon on your way to the via Fori Imperiali. If you have time, you could also take a small detour to visit the Trevi Fountain before going to the via Fori Imperiali. If you take a bus from the Vatican to the Coliseum, you'll skip Rome's historic center but will have a little more time at the Coliseum and/or Vatican. From the Vatican, there are plenty of buses that take you to the via Fori Imperiali, including the 64 and the 40. By finishing your one day in Rome at the Colosseum, you will be at the Colosseum Metro stop, and can get to Termini from there. I strongly recommend you consider having a guide for both of these sites. You will also want to hire a licensed guide. Only licensed guides are allowed to give tours of the Vatican. And for the Coliseum, this is also true, although harder to patrol. But they do check the guides sometimes to make sure they are licensed and it would kind of ruin your short time in Rome if your Coliseum guide is stopped in the middle of the tour for not having a license. The reason I recommend guided tours is that both are vast and very intense places to visit, and a good guide can bring them to life, and bring out the best parts, so you get a real feel for them, without being overwhelmed. At least not too much. One option is to do the audio tour for both. Another is that each site also have their own guides you can hire. Third, you may wish to join group tours of both. And finally, you can hire a licensed private guide, who will take care of showing you the best of both sites, and making sure you easily get between the two as well. If you are interested in taking a group tour, or hiring a licensed guide, I will be happy to give you information on either of these, and if you like, help you to hire your licensed Vatican and Coliseum guide. Please contact me for more information. If you have one day in Rome, and want to sight-see but at a slower pace, I'll give walking options, and some less strict suggestions about where to go. This is for the independent traveller, who does not want to be rushed, or have a guide, or have a must-see list for their one day in Rome. This kind of visit might include lots of sitting and people-watching or coffee/gelato tasting so I'll give plenty of options for those too. I would suggest starting at Piazza Barberini, since it's a convenient metro stop, and very central. From there, take via Sistina to the the top of the Spanish Steps, for a great, first-impression rooftop view of Rome. From here, keep walking along the wall along the top of the Spanish Steps. Now you can see that gorgeous view, but without the crowds. You mostly have it to yourself. As you walk along this road, you will come to a street that ramps up (not the first one, the second one.) Take the street and you will wind up on the Pincio, a lovely spot for beautiful views of Saint Peters Dome, Piazza el Polo (below you), and general rooftop views of Rome. Depending on the weather, you may want to wander back into the park, which is actually pretty large. There are lakes, cafés, fountains, museums and gardens and it can be a lovely way to spend some time in a one-day in Rome visit, without the rush of monument sight-seeing. Come down from the Pincio into Piazza Del Popolo. Hang out at Canova or Rosati café (they are the only two cafés on piazza del Popolo), and do some people-watching. Sitting at a café in a main square comes with a price. When you sit at a bar or café in Rome, you will pay more for what you order. Don't forget, this means you do not need to tip. From here, you might stroll down via di Ripetta towards the mausoleum of Augusto. Make your way along via Monte D'Oro towards Piazza San Lorenzo in Lucina. From the top of the Spanish Steps, walk down them on either side and you will wind up in the Shopping Zone. Spend some time wandering the streets both across and down, especially if you are a shopper or even window-shopper. Here there is something for everyone. Click here to read more about Shopping at the Spanish Steps. Piazza San Lorenzo in Lucina is another lovely spot for sitting and people watching. At Bar Vitti, you can get granita, which is a kind of iced coffee. At Ciampini, try their exceptional gelato. From here, walk down the small back streets until you come to via della Scrofa. Take this towards Piazza Navona. Once you visit Piazza Navona, either head towards the Campo Dei Fiori, or towards the Pantheon. Last stop will be the Trevi Fountain, and then back to Piazza Barberini to get the metro to wherever you need to go. Maybe you've been to Rome before, or maybe you just realise that with only one day here, it's not feasible to do much sight-seeing so you might as well go shopping! Either way, Rome is a shoppers' paradise and you can spend the whole day visiting various shopping neighbourhoods. Take the Metro line A to Spagna (the Spanish Steps). This is the main shopping area of Rome. When you are done with this area and its more well-known shops and brands, make your way towards Campo Marzio, on your way to the Pantheon. There is plenty of great shopping around the Pantheon as well. If time permits, go to Piazza Navona, and heard towards via del Governo Vecchio, the street leading away from Piazza Navona to the left of the Brazilian Embassy there. This is an excellent shopping street full of fun cafés, boutiques, vintage clothing stores and more. You may also want to stop at Cul de Sac for a nice glass of wine and light lunch. Otherwise, if you are running short on time, or just done shopping, you could start making your way back towards the Trevi Fountain and then to the Metro stop on Piazza Barberini. If you do decide to go down via del Governo Vecchio, then when you reach Piazza dell'Orologio, cross over Vittorio Emanuele, and start walking up via dei Banchi Vecchi towards via del Pellegrino. This is a funky shopping area with lots of cute boutiques and cafés. Pass through Campo dei Fiori and walk up via dei Giubbonari. This is a more heavily trafficked, and less "interesting" shopping street but there are some interesting food stops along the way, namely Roscioli bakery (on via dei Giubbonair) and Dar Filettaro (on Largo dei Librari, 88), where you can get a Rome specialty treat, battered fried cod. If time has run out, you might go to Largo Argentina and catch a taxi or bus to where you need to be. Many buses stop here and go to Termini. Walk from the top of via del Boschetto to via Leonina, then up via Urbana. So many cute shops, so little time!! I once went to Paris with a sick friend. We decided to just spend the time hanging around and soaking up the atmosphere. We didn't visit a single monument or museum. It was a different and wonderful way to experience the city. I will have a great memory of that trip always, particularly because of my friend. We ate, drank and were merry. First things first: a yummy breakfast (and a newspaper for the maximum café-sitting experience.) That means great cappuccino and a really superb pastry. So you need a pasticceria. A bar has basic pastries that are normally frozen and heated in a convection oven. They are fine, even delicious. But a pasticceria is a place that specialises in pastries. Now we're talking. There are lots of amazing pasticcerie (pastry shops) in Rome. Most of them are places to get your pastries to go. But, it would be nice to sit and enjoy this lovely Roman breakfast. So let's start in Piazza San Lorenzo in Lucina. As I've said on other pages, this is one of my favourite piazza's for sitting, people-watching and soaking up some of that Roman atmosphere (and sunshine!) Try Bar Vitti. They have tables outside, and with umbrellas in summer and heat lamps in winter, and a vast array of delectable pastries. Take the 116 through the city center, near Piazza Navona, into Campo dei Fiori, onto the picturesque via Giulia, and along the Tiber river. When you get to the very end of the line, you will be across the river. Get off the bus, and with your ticket still valid for one transfer, get onto the 115 bus, and let it take you all the way to the top of the Janiculum hill (Gianicolo). Get off at Piazzale Garibaldo and spend some time looking around, and enjoying the views. Your view from the left is a panoramic view of Rome. From the right, you will be looking over Vatican City and Saint Peter's Basilica. Continue your descent along via Garibaldi, coming to the Mausoleum for the War Dead, or Ossarium. Just after the mausoleum, you will come to a hairpin turn to your right, but on your left, there is a church, San Pietro in Montorio. It's a beautiful church with very special frescoes inside, but it is almost always impossible to go inside this church, as it's privately owned and usually open only for weddings. I have gone in during a random wedding (shhhh!) so if you find the doors open, turn off your cell phone, and respectfully pop in, staying in the back. Right next to this church is the wonderful Tempietto del Bramante, which is in fact, housed in the private courtyard of the above-mentioned church. So again, you cannot go inside, but it is worth a peek through the gate. Continue descending via Garibaldi. At one point there is a kind of dangerous street intersection, so be careful! Just after this intersection is a staircase going down. This will take you through the back way into the heart of the charming and quirky Trastevere neighbourhood. Once in Trastevere, you can find a nice spot for lunch, stroll through the cute streets, hang out at a wine bar or do some shopping. For a bit of culture, stop into the church of Santa Maria in Trastevere, one of the oldest churches in Rome, and a spectacular example of Byzantine mosaics. From Trastevere, make your way back across the river, crossing the Tiberina Island just for fun. This will put you into the heart of the Jewish Ghetto, but also close the the Capitoline Hill. You could spend a little more time doing more neighbourhood exploration in the Ghetto, or, go up the hill of via del Teatro Marcello to get a glimpse of one of Rome's most important sites, The Roman Forum. You can see this from the top of the Campidoglio Hill. If I was spending this one day in Rome with my friend, as we did in Paris, we'd be just about ready for a late afternoon/early evening wine bar to sit, relax and review our day. A perfect end to our very laid back day in Rome would be at the Enoteca Provincia di Roma, right near Trajan's Forum. Free wifi, wine, and a gorgeous view of the ruins just outside your window. What more could you want in one day in Rome? You have been to Rome before. You've seen the major sites. Palazzo Altemps - a wonderfully presented collection of Greek and Roman sculpture, shown inside an old ducal palace. Right near Piazza Navona. Villa Torlonia - Il Duce's party palace. Mussolini did not live here, but he used to have parties here. And today it houses several museums, including a museum of futuristic art. It's worth going here just to visit the grounds and see the buildings. There is also a nice restaurant, where it's wonderful to sit outside in warm weather. Palazzo Doria Pamphilij - this has to be the most under-rated and under-visited of Rome's art museums. It was the palace of the noble family Doria Pamphilij (in the height of their wealth and power in the 1500's and 1600's), and it will take your breath away. You can visit the palace as the family lived it, and then see some of their vast and amazing art collection in the galleries. It's like a mini-Versailles, although not even that mini. It's right on via del Corso, in the heart of Rome's historic center, so don't miss this! The modern art museums of Maxxi and Macro - Rome's modern art scene has been flourishing in the past several years. The Maxxi museum is worth visiting just to see the building itself (and it has a great cafe.) The Macro museum recently expanded and is now very worth the trip to see it. The Criminology Museum (isn't that cool?) - This one is a bit quirky but it's a very extensive collection of the history of crime and much more. For example, you can find many objects belonging to the most famous executioner of his day (1700's), Mastro Titta: his blood-stained cloak and his axe. The museum of the Ara Pacis - this museum was built entirely to house one thing: the Ara Pacis, or Arch to the Peace. It seems silly to go to a museum to just see one thing but actually, there is much more: the building was designed by architect Richard Meyer and is a superb use of light and glass to showcase this incredible archeological find. Also, you will often find students restoring this ruin. And, I love the diorama of ancient Rome that you see when you first walk in. It shows you where the arch would have been originally but you will also see the placement of other ancient Roman monuments such as the pantheon. On the lower level, there are more relics from Ancient Rome that were found near the arch. And finally, there is often a secondary exhibit there. I once attended the very last showing of all of Valentino's gowns, before he retired. I will never forget that, and the special ambiance of that building, which was perfect for the show. Return to the top of One Day in Rome.